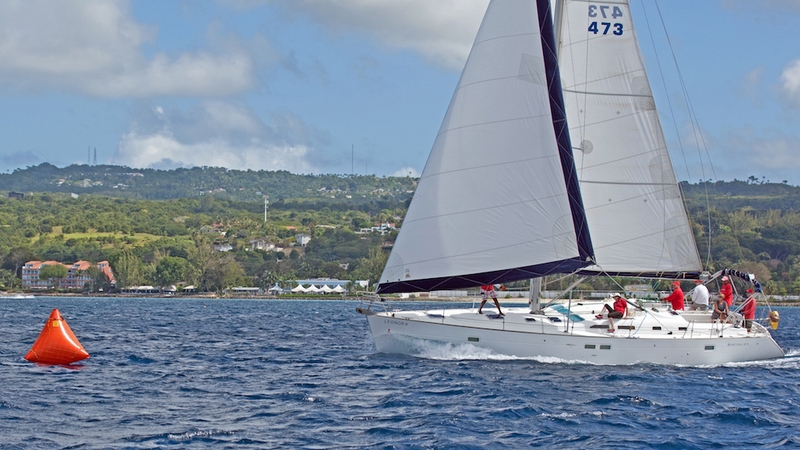 The final day of the Coastal Series at the 80th anniversary Mount Gay Round Barbados Regatta, organised by Barbados Cruising Club in association with Barbados Tourism Marketing Inc, and Mount Gay, concluded in fine style yesterday, 19 January, with sunshine, wind up to 28kts, and a relatively flat sea. The ultra fast flying machines in particular, including the multihulls, reveled in the conditions along the south coast of the island with a long beat out to Oistins and a rewarding blast back home. In Carlisle Bay, where winds remained around 18-20kts, the J/24 fleet enjoyed yet more close battles in the final four races of the series. 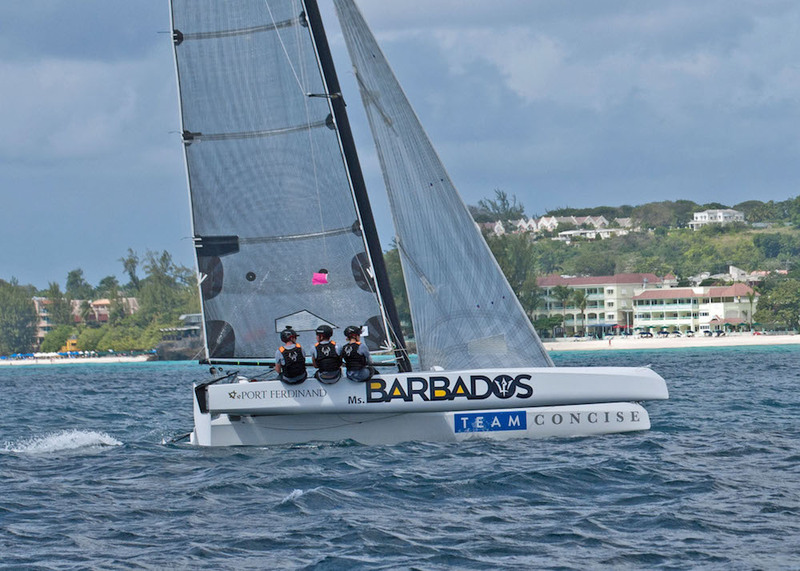 With Robbie Yearwood and team on Island Water World Die Hard from Grenada, and Neil Burke and team on Impulse equal on points going into the final day’s racing, competition was guaranteed to be intense. The situation looked good for Burke and team on Impulse with two wins in the bag after the first two races, while Yearwood and Team Island Water World Die Hard suffered with a couple of penalties, which left them having to count a third and a fourth. Living up to their name, however, Team Die Hard fought back and won the final two races, which left them snatching the title from Impulse by just one point. Ian Hickling and crew on his Catalina – Ten Seven – enjoyed their best race of the series today in CSA Cruising Class. Although they were unable to dislodge David Spieler and team’s overall win on the Beneteau Oceanis 473 – Leonora – they won today’s race in fine style. Priscilla Richardson and team on Tropic Bird (Hunter 35) scored another win in Non CSA (Local Rating) class today to secure first place overall in the series. Mark Mostovac’s Jeanneau Attalia 32 – Waymar – finished fourth today but it was still enough to retain second place. However, one of the most impressive performances in class was Team Shangri La (Morgan 41) sailed by Jonathan Gittens and team. They had a good start in the building breeze and continued to sail well throughout and finished the day with a well-deserved second place, and third overall in series. Some of the most exciting racing this week was in the Multihull Class between Bryn Palmer and team on the RC30 catamaran Silver Bullet, and Team Concise 12 on the Diam 24 trimaran. With one win apiece, the stage was set for the final showdown today. Both teams were fully charged ready to go but it was obvious from the start that Jack Trigger, Rob Gullan, and Helena Darvelid on Concise 12 had the edge in today’s conditions. They were able to really crank up their super-powerful machine and pull out a respectable lead over Team Silver Bullet. A long spinnaker run in clear air back from South Point was all Team Concise 12 needed to secure the overall win of the Coastal Series. Trigger commented: “I think we just found another gear today and everything felt good. We got away on the start line and that was it. But I have to say, having Silver Bullet to race against was great because that first race in particular, that they won, was so close. After three days of intense racing and lay day tomorrow, crews are making the most of the local hospitality tonight at the Post Race party at Barbados Yacht Club. Lay day activities tomorrow include a Mount Gay Rum distillery tour at Brandons in the morning, and a specially laid on regatta exhibition polo match and party at Holders Polo Field, St James in the afternoon.